Thus, outside nothing exists as an object. Therefore, the perceiver as well does not exist. And thus dharmata, empty of both, is established. 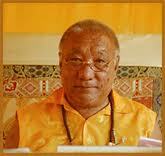 Khenpo Tsultrim Gyamtso Rinpoche, Meditation on Emptiness, Nalandabodhi Publications, 2001, p. 35. Translated by Susanne Schefczyk (Lightly Edited for the Weekly Quote).